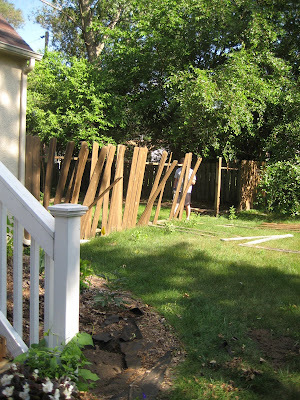 marital bless: Fence Party on Saturday! What? You don't equate raising a fence to be the fun of a party? Well then, you do not have a fun bone in you, because it's going to be awesome! Or atleast I hope at the end of a the long day that our friends will be able to have fun! Tony and I have been clearing away brush, wood fence, chain link fence and have dug up approx 30 fence posts - complete with Silver Maple roots and concrete. We've been in the yard from 6:30 to 9:30 every night for the past 1 1/2 weeks . . . but we're almost primed for our Bobcat delivery. 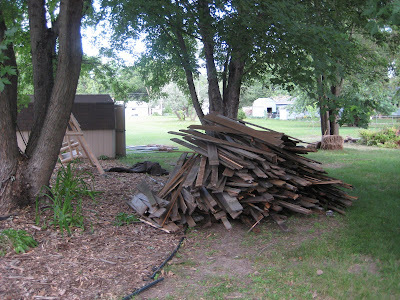 On Thursday we have a crapload of wood being delivered, and by crapload, I mean enough for 90 posts and 1400 boards. It is hands down the most money I have ever spent without a credit card or loan involved. Wow! I am super impressed!!! Can't wait to see the finished product. Good luck with the install :) I will have a virtual lemonaide waiting for ya! Very cool, I can't wait to see the finished product! Our new fence is being installed next Thursday and I cannot wait. But we went the easy route - we're having someone do it for us! Oh, Leah. You're the best. Thanks so much for the un-ending sweet comments. It really means the world to me. And, if I was closer, I'd so be at that fence party.